Cuscuta gronovii Roem. & Schult. Usually in marshy or swampy ground. 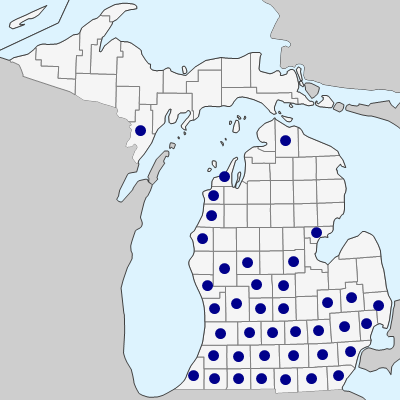 The most frequent hosts include Impatiens, Salix, Cephalanthus, Decodon, and Eupatorium, but documented Michigan hosts involve species in over 40 genera in at least 25 diverse families. This American species has become naturalized as a weed in Europe. This is by far our most common species; skeins of orange stems covering vegetation a frequent sight in southern Michigan. It is also highly variable. The flowers are often somewhat glandular-warty, especially toward the summit of the fruit, and this aspect in combination with the rounded corolla lobes may be helpful in identification. 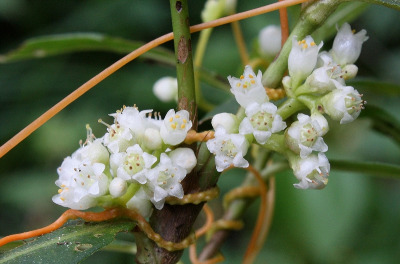 The flowers are (2–) 2.2–4.2 mm long; the old withered corolla generally surrounds the fruit, or is sometimes persistent at the base of it. The styles are ca. 1–2.2 mm long. A specimen from Monroe Co. has been identified as the more southern C. rostrata Engelm. & A. Gray, but we are dubious and consider it an unusual C. gronovii. MICHIGAN FLORA ONLINE. A. A. Reznicek, E. G. Voss, & B. S. Walters. February 2011. University of Michigan. Web. April 21, 2019. https://michiganflora.net/species.aspx?id=855.